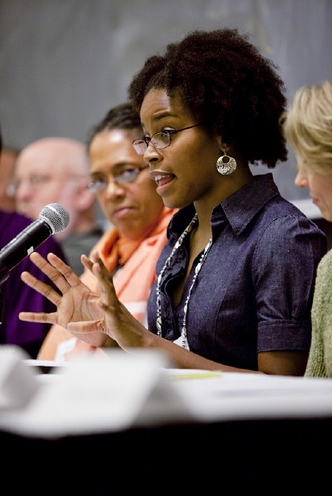 Jessica Marie Johnson is an Assistant Professor of History and Africana Studies at Johns Hopkins University. Johnson holds a Ph.D. and M.A. in History from the University of Maryland, College Park and a B.A. in African & African American Studies from Washington University in St. Louis where she was also a Mellon-Mays Undergraduate Fellow. Her research interests include women, gender, and sexuality in the African diaspora; histories of slavery and the slave trade; and digital history and new media and has appeared in Slavery & Abolition and Meridians: Feminism, Race and Transnationalism. As a digital humanist, Johnson is interested in ways digital and social media disseminate and create historical narratives, in particular, comparative histories of slavery and people of African descent. In 2008, she founded African Diaspora, Ph.D., a blog highlighting scholars and scholarship in the field of Atlantic African diaspora history. Johnson continues to make media as a member of two collaborative projects: the LatiNegrxs Project, a Tumblr and community interrogating Afrxlatinidad from the lens of transformative justice; and the Queering Slavery Working Group which she co-organizes with Vanessa Holden (Michigan State). She’s the recipient of research fellowships and awards from the Woodrow Wilson Foundation, the Gilder-Lehrman Institute, and the Richards Civil War Era Center and Africana Research Center at the Pennsylvania State University. She was recently named a 2015-2016 Mellon Postdoctoral Scholar in the Program in African American History at the Library Company of Philadelphia. Johnson has two works in progress. One is a history of free women of African descent laboring, living, and traveling between eighteenth-century Senegal, Saint-Domingue, and Gulf Coast Louisiana. The second, in collaboration with Mark Anthony Neal, is a compilation of work reading nineteenth-century black codes against present-day race coding and digital vernaculars of people of African descent. She tweets as @jmjafrx. Learn more about her research here.